Back spasms are not fun. Once one gets a hold, it has no mercy. There are various different reasons why they happen. For many of us over 30 & 40+ they can happen more frequently. Here we will talk about what happens in the muscles during a spasm, possible causes – so you can be more aware, how to ease them when they happen and how to reduce the chances of them from happening. Also included are guided massage techniques you can do yourself to ease and reduce the pain, and a guided yoga flow to establish better support and maintain a more durable back. These are effective methods that will keep you pain free without depending on pain medications. A back spasm is an involuntary contraction of the muscle or muscle group. When there is quick or unusual movement, the person experiences a dramatic catching sensation that makes the person feel stuck and not able to move. Sometimes it can make a person feel as if they are not able to breath due to the intense pain. Understanding the structure of muscles can give a deeper insight about what is going on when the pain hits you so that you can address the issue appropriately. Muscles are made of lots of individual fibers strands that are packed together and act as one large structure. Muscle fibers are actually muscle cells that are thread like, long in length, and are slender in shape. On this level, they are fragile and vulnerable. Fibers are mostly arranged in parallel rows that are bunched together and wrapped in connective tissue (called fascia) that gives them added strength as a group. The structure of an individual strand is where most of the work takes place for a muscle to function. As shown in diagrams 1 & 2, there is a lot involved to make a muscle work, and they all must coordinate with one another to achieve their overall purpose. However, when they get out of sync, is when the problem begins. The first diagram shows the smaller group of fibers bunched together down to an individual band broken down to show the internal structure. The second diagram shows all the players that make each individual muscle contract and release, using four different proteins (Troponin, Actin, Tropomyosin, and Myosin ), which makes up the myofilaments. proteins of the myofilaments. It is an important chemical factor behind contraction. It assist actin and myosin to connect so that contraction can occur. Sometimes, however, things don’t always go as planned. Spasms occur when calcium leaks from its place in the muscle fiber’s anatomy. This displacement triggers a persistent contraction that happens without nerve stimulation, which makes it involuntary. Being stuck in a spasm also indicates the lack of elasticity of the muscle fibers. Elasticity allows fibers to return to their original and resting state. Spasms can happen in intervals or when movement occurs. Typical causes include lack of dynamic movement, dehydration, poor diet, magnesium deficiency and displaced calcium in the body. The lack of movement is especially an issue when at one point in your life you were more active and did more physical activities, but have slowed down to not being active at all. It is important to bring dynamic movement in the body often. Movement keeps key elements and nutrients in the body flowing, moving, and flushing out toxins. This can be done with a yoga practice, walking, dancing, hiking, etc; or even how you move around in your day to day. Poor posture is another trigger for spasms. When standing; this is indicated by shoulders rounding forward, favoring one side to stand on, carrying heavy bags often that disables you to move your arms and balance when you walk, sway back, and a weak core. When sitting, poor posture is indicated by being hunched over at the computer or when driving, rounding of the mid-back, favoring one side when sitting on the couch, slouching, when your feet does not reach flat on the floor or not having 90 degree angles between your hips to knees and knees to ankles, or not having adequate support for your back. It can also be triggered by using improper posture when picking up heavy objects. An example of this is when bending over at the waist with straight legs; extending from the arms to grab an object that is not close to you. Spasm (pain) happens when you are not engaging larger muscle groups to lift – meaning not using the quads and hamstrings in the thighs with the assistance of the core. The best thing you can do as soon as you have an episode is to not do anything strenuous. Find a comfortable (as possible) position and take a few deep breaths. Began to soften your thoughts and soften all muscles in the body by using the breath. Do micro movements in the body to find some relief (these are very small and conscious movements). Each small movement that brings some comfort, pause there and breath deeply. It is important to not let your thoughts get ahead of you or out of control. Believe it or not, negative thoughts makes the experience worst. The more you can relax your thoughts, the more you can think clearly to know what to do next. Even when the pain is at its worst, that is the moment to relax through the breath even more. Uji (or ocean sounding) breath from yoga, can help create softness and to ensure that your thought process does not get out of control with panic. Unfortunately just relaxing will not completely resolve the immediate pain, but in the moment when you are not able to get immediate help, it can ensure that you will not do more damage. Allow the shoulders, the abs, and anything else that may be tensed to be very relaxed. Create a softness throughout the center of your body and your being. 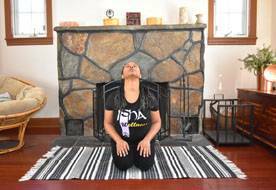 This does take practice, so if you know that you are prone to spasms, when you are not in an episode, practice yoga breathing (pranayama) and embody it. Practicing makes it easier to tap right in when you are in the worst pain. Check out a more detailed explanation of Pranayama. Put heat to the area. If you have a heating pad, that is fine, but heat from water is best. It is not as intense. Avoid icing. With the cold, the muscles and other surrounding muscles will contract more. Ice is good for excessive heat or inflammation from certain injuries. However, in this case you want to relax the muscles, and adding heat will assist with that. Take a nice warm shower or bath and let the soothing warm water relax the contracted muscles. The very best thing to do is to take a warm bath with either magnesium flakes or with epson salt. Magnesium plays an important role in body functioning. An estimate of 2.5-15% of the population has a deficiency in magnesium due to a decrease in dietary intake through foods like dark leafy greens. When the body misses this important mineral, all sorts of things can go wrong, including muscle spasms. Magnesium can help relax contracted muscles. “Magnesium bath flakes, or bath salts, are a form of transdermal magnesium (“a method of mineral supplementation designed to deliver magnesium through the skin for rapid absorption into the cells”). The warmth of the bath water assist with this process by opening the skin pores and cells for better absorption. Once the intense-ness of the pain has settled down, find a massage therapist who is therapeutically inline. Therapist who specializes in Therapeutic specific massage, Neuromuscular massage, Integrated Positional Therapy, Cranio-Sacral Therapy (this is more energy work than a massage, but it is good if you are not at a point to have someone massage you), and Deep Tissue massage. Using a therapist is the best because they are able to find exactly where the pain is stemming from and work it out. Firstly with a massage, you get to totally relaxed, which is important when working out a spasm. Massage will move out the calcium waste that has leaked into the tissue, as well as any other metabolic waste. By moving out this waste, massage will make space for and move in fresh oxygenated blood and beneficial nutrients to the area that will heal and regenerate the muscles. Be sure to keep up with your water intake and stay hydrated. Clean water is important because it flushes out toxins in every aspect of the body. It also enhances circulation, which is key for getting necessary nutrients, vitamins and minerals to muscles by way of the blood stream. In addition to breathing, water also provides oxygen in the body and helps blood cells to move more freely throughout the body so that they may provide oxygen to all other cells; muscles cells included. If the water in your area is not the best, there are some great water filters available that you can attach to your sink for convenience and will last a year. Magnesium rich foods are spinach, kale, collards and Swiss chard. Other foods that are a good source are nuts, cereals, spices and cocoa. Nutritionally, include more dark leafy greens in your diet. Greens are more effective when they are organic. When foods are not organic, you never know what you are truly getting. With so many things being added to conventional foods (even with fresh vegetables) valuable minerals like magnesium could be stripped out and reduced. When preparing greens, make an effort to eat them raw (if applicable), juice them or saute them as a way to not overcook them. It is possible to cook vitamin and minerals out of food. Greens that are rich in magnesium are spinach, kale, collards and Swiss chard. Other foods that are a good source are nuts, cereals, spices and cocoa. The solutions here not only work well to reduce your pain and give you tools to manage them, but they will help to the point of taking your life back and living fully and freely. If you are not able to get to a therapist, there are somethings you can do yourself. Massage and Yoga are your best friends when it comes to issues like this. If you have been diagnosed with cancer, have blood pressure issues eye issues, or other possible limitations, it is very important to read the disclosure below before starting the guided material. If you would like to know any alternative postures, fill out the contact form below. The best way to relieve a back spasm with massage yourself is to use a “Pinky” ball. Yes, they are made for fun, but yet an awesome self massaging tool. You can roll the ball around the sore area or hold it in place on the pressure point until you feel a release. When holding a pressure point, you may feel the greatest of sensations. Deepen your breath in this regard. Allow the breath to be full and for it to move your whole torso. Do not strain the breath. Even though it is deep, let it be soft and fluid. Most important, when holding a pressure point, on the inhale imagine that you are bringing the breath specifically in to the sensation. On the exhale, totally relax into the sensation as you continue to hold. Do this several times, then find a new point. You can always come back to the same points if you want to. Go back and forth between rolling and pressure point hold. This action will break up tissue adhesion that may have formed to protect the muscle group, and it will move out calcium waste and other metabolic waste. Doing this will also encourage fresh, oxygenated blood and other useful nutrients to flood the area for a better healing process. For traction and resistance use a wall or the floor. If you don’t currently have a ball, you can actually use the corner of a door jam. Just keep in mind that the wall has less give than the Pinky ball and could be too intense, so do not press too hard. You want to avoid bruising or overly traumatizing the muscles more. If you are able to reach the area with your hands, take your thumb, knuckles, or fist (start in slowly) and progressively press straight in to the area with a stagnant hold then slow circles; deepen your breath (using the Yoga breath) and be patient. Do not try to overwork it, press in too hard, or be too fast and harsh. If you are using your thumb, press straight in with the tip of the thumb and avoid bending the thumb backwards. Of course if you have a loved one who is willing to help you with a massage, be sure to communicate exactly what you need and don’t need so that they will not re-injure the area. Yoga can achieve three things with this issue. As an awareness, Yoga is much more than the postures (asanas); it is a state of mind, developing optimum breathing habits (pranayama breathwork), and it is a practice that becomes a lifestyle. If you are in major pain and are not able to do yoga postures, that is OK. Give yourself some time to rest first to control the pain. In the meantime, do the pranayama and attend to your state of mind. This builds strength and resilience. In the moment of an episode, modified yoga movements can be helpful. However, when you are able to do a full-on Yoga posture flow will be for maintenance. For a yoga flow that is focused on strengthening the back, follow the flow below and enjoy. Start: Make sure your shoulders are over your wrist (do not lock your elbows) & your hips are over your knees. Avoid a dip in your low back by rounding from your tail bone slightly. Take 3 full deep breaths. Inhale through the nose, exhale through the month. Be as relaxed as possible through the breath. Next: Slowly lift from your hips as you straighten the legs. Do not lock your knees and elbows. Do not strain your muscles here. Feel the back releasing and letting go. Just hang here, effortlessly with 3 slow deep breaths. *If you have glaucoma or any major eye issues, skip this posture. End: Transition by bending the knees until your lower legs are on the floor and press back into Child Posture with arms extended. Relax here for more than 3 deep breaths. If this position is challenging due to belly or chest, then walk the legs outward & rest in between the legs. just melt with relaxation. Start: Sit on your knees, on your buttocks on a cushion or in a chair. Close your eyes, & just be here for 4 slow deep breaths. This sequence can be done in four distinct directions or in a fluid circle. Start with the four directions: side, back, side, and forward; then reverse. Then do a round of fluid circles. Flow: to the right side curving at the waist. The focus is to bring the hip and the shoulder towards each other and let the head hang to the same side. Drop the top of the right shoulder downward. 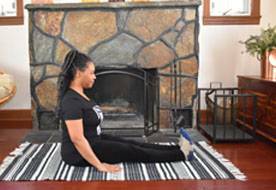 This position will create a gentle stretch on the other side of the body. Do not lift the buttocks away from the legs, cushion or chair (if you are seated). If you need more balance, bring your left hand to the floor. Roll around to the back. Lift the head up and look towards the ceiling. Lift and press the chest and belly forward. This will create a slight arch to the back. This is OK, just do not strain or over work the movement. Lifting out of the spine will avoid a crushing feeling in the low back. Stay here for a few breaths. Flow over to the left side. Follow the instruction for the right side. After being here for 4 deep relaxing breaths, flow your movement to the front. Then reverse the movements. 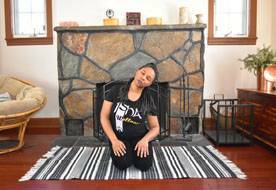 After the reversed set, allow this movement to be fluid in circles and coordinate your breath - each time your belly goes forward inhale; when you round the back (sinking the chest and belly) exhale. When preparing for Tadasana (or Mountain Pose) check your posture. Toes are facing forward, knees very slightly bent, arms to the sides, shoulders down, and the crown of your head reaching up. From the side view. To avoid an arch in the low back, slightly round your tailbone under. To avoid poor spine posture, bring your shoulders back and down. Slide your shoulder blades towards one another and engage your core around your belly. Tadasana: Inhale your arms out to the side & over head. Allow your shoulder blades to slide down and in toward each other. Reach your arms straight up, while moving the tops of your shoulders away from your ears. Both feet are firm on the floor with all four points touching the floor. Feel the effortless balance here. Doing this posture often will train your mind in knowing what a healthy posture is. Lean over to one side, bending at the waist. Keep the shoulders and hips in place and only move the soft part of the waist. Maintain an even and firm stance with both feet. Engaging the core will help you to balance and to strengthen your core. Remember, this is for back maintenance. Do not over twist. The goal is to bring dynamic movement to the mid section of your body, so relax as much as possible here. Seated Tadasana: Focusing on posture correction. 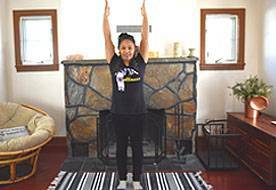 Straighten your legs in front of you and raise your arms up over head. To create a straight back, round slightly at your tailbone, lift the crown of your head toward the ceiling, drop the top of your shoulders away from your ears, and gently press forward with the front of the body. Do not create an arch in the back. Let it be naturally inline. 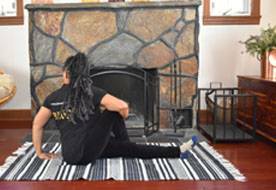 Seated Spinal Twist: Bring your right leg over your left leg (keeping left leg straight), keep both buttocks firm on the floor. 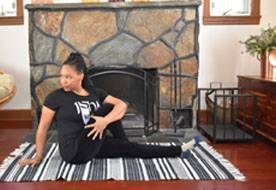 Twist your upper body towards the bent leg and wrap your left arm over the right leg. 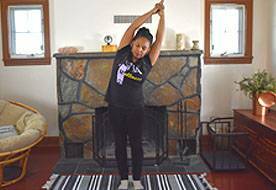 Keep your back straight by lifting the crown of your head toward the ceiling and gently pressing your torso forward toward your bent leg. You can brace yourself by bringing your right hand to the floor. Keeping your legs in the same position, rotate your torso around to the other side. Remember to maintain the lower body position explained previous. Stay here for 3 slow deep breaths and on each exhale sink deeper into relaxation. Sink into a deep relaxation. 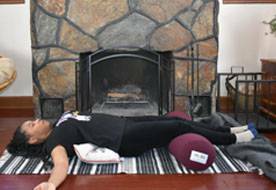 Put a pillow or bolster under your knees and a pillow under your mid to low back. Which ever feels the best. Allow your arms you extend out to the side with the palms facing up. Do a few slow deep breaths. With each exhale, feel as if you were sinking deeper into the floor. Be here as long as you need. 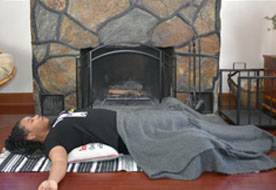 Be mindful that, with not moving, you may get cold so get a blanket, socks, and what ever you may need so that you can be in deep relaxation without distractions. Let the mind go. Let all muscles throughout your body go. This is your time. Enjoy it. Need a real time demonstration? Watch our YouTube tutorials and subscribe to keep up with what is new from us. However, it is important for me to give some disclosures. With massage, if you have had any lymph nodes removed or are currently on chemotherapy, please check with your doctor about any awareness you and your therapist need to know. With yoga, if you have any major physical limitation or had recent surgery, be very mindful of your movements and do not over do it. Take your time and do micro movements at first to make sure you are able to comfortably move in and out of postures. If you have high, uncontrolled blood pressure, consult with your physician first. If the pain in your back does not come in waves or does not go away in a few hours or a day, call your doctor right away. There maybe other issues taking place that is not specifically “muscle spasm”. If the pain feels more deep, internal and just on the other side of the ribs in the back, it could be your kidneys, a kidney or gall bladder stone, or UTI. These issues are doctor worthy and important to deal with early. Also, there are some inversion postures in this flow, so if you have glaucoma, cataracts, or any major eye issues that you should not put your head below your heart, then skip those postures. Stay tuned for a more in dept guide, both as a book and in video. Subscribe to stay up to date with related topics. If you have any questions, would like more information or need modifications, please fill out the form below. I will be happy to assist you in any way I can. This book is an added resource and a must read for establishing healthier posture and relieving pain without medication. Available through Amazon.com. Click on book to purchase.